It’s almost December, time to make a reckless prediction for the New Year. Here’s ours: In 2012, everyone will be eating French dips. If you’ve tried the magnificent version of this storied sandwich that Riad Nasr and Lee Hanson have concocted for Minetta Tavern’s brand-new lunch service, we’re sure you’ll agree. This thing is a trendsetter. It’s roasted culotte steak, sliced to order; a perfectly textured butter-toasted, garlic-rubbed roll; and a heady cup of dipping jus. It’s the primordial joy of meat and pan drippings on deliciously sodden bread. 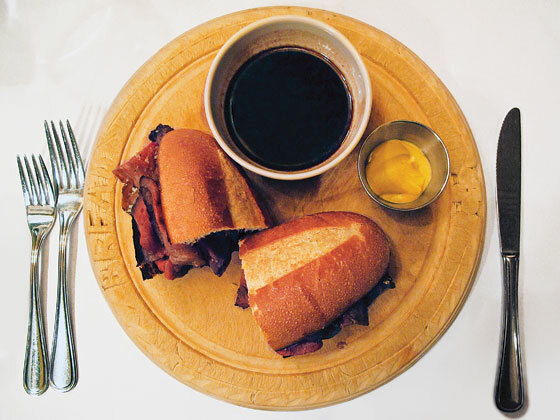 Dare we say it’s in the same class as the French dips you get at Philippe’s and Cole’s in L.A.? We do (113 Macdougal St., at Minetta Ln. ; 212-475-3850).